Posted on Wednesday, July 16th, 2014 at 12:47 pm. Trainers have the tough task of managing many tasks, which can be eased through effective planning. 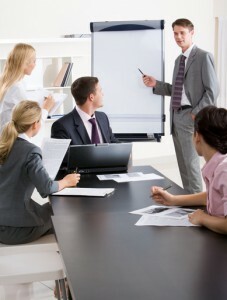 To gain new skills in training others, consider participating in Train the Trainer Training Course offered by pdtraining in Baltimore, Boston, Charlotte and other cities in the U.S.
Do I have enough time to cover each topic? Make sure that you plan time for each of the topics differently, as not every topic will require the same amount of time. You may consider the qualifications and age group of the participants when assigning time for each topic. For instance, if you know that the participants will have basic knowledge in a certain topic, you can spend less time on it while giving more time on topics that you know the participants will be unfamiliar with. What method of interaction should I choose: formal, semi-formal or informal? When selecting your style of communication, consider the industry, job profile, expectations of the participants, and their age-group. Depending on it, mentally prepare yourself to provide training in that style. What precisely are the skills the trainees must learn by the end of the class? There must not be a difference in what you plan to teach and what the participants want to learn. When you are planning delivery of the training material, make sure that you have the learning expectations of the participants in mind at all times. How will I promote learner participation? Learning is best done when there is interaction. It is important to use techniques to encourage learner participation during the training. Make sure that you plan to handle uncooperative and shy participants. Am I equipped to handle disturbances? Disturbances can easily impact your training and you. It might be the equipment not working properly, participants appearing late for the class, or your own problems getting in the way of providing good training. If you plan against disturbances, you will drastically reduce their negative impact on the training. Make a list of possible disturbances and write down their solution. It will help you to mentally prepare for any untoward event that may negatively affect your class. Is my method of organizing appropriate for the training? How you organize your training material, content of the training, and its delivery affects the quality of your training. Well-organized training enhances clarity, reduces the amount of time it takes to deliver lessons, and helps you to deliver the training without confusion or chaos. How can I build positivity and confidence in the participants? The environment in which training is delivered has an impact on learning. When planning your training session, along with the training content and its delivery, also plan how you can create a positive, comfortable and dynamic environment in your class. The use of positive words, sharing of personal anecdotes, and having fun activities are some of the methods you can use to build a training environment that supports learning.